Sennheiser Ambeo is probably the most exciting product that the manufacturer has made for a while. It is not pure in-ear headphones as there are some interesting features inside. This becomes more attractive as the price tag is very reasonable. So, let’s check out the Ambeo smart headset. The product comes in a simple box, you will just be able to find the headset, a cloth carrying pouch, and some spare eartips. The product looks like sport earphones with over-ear hook design. Some people might dislike it since the exterior is made of plastic and it doesn’t look like a premium product for professionals. I have no complaint because this design helps secure the earphones and they never drop out of my ear again. My concern is the chunky in-line controller. It is not something heavy but I can feel the weight, it would be much better if there was a clothing clip for this part. Besides, all the cables are not removable easily, so you will be in big trouble if anything is broken. Another problem is that the Ambeo has only the lightning connector, that means I can use it with my iPhone only. It is not compatible with my MacBook or any Android device. Therefore, this is not really a good choice if you’re looking for earphones to use with different devices. 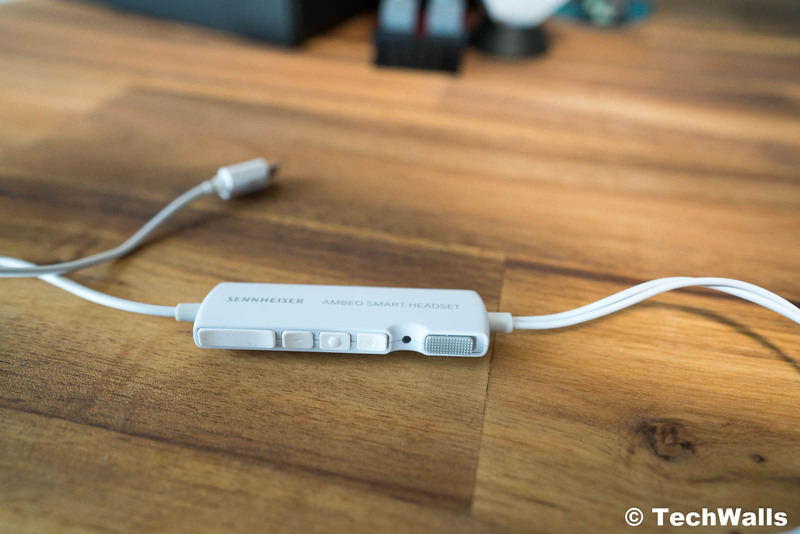 Sennheiser said that a version with USB-C connector would come soon but it hasn’t been available at the review time. The most notable feature of the headset is the omnidirectional microphones on the outside for binaural recording. To start using the feature, you will just need to plug the headset into your iPhone and it will override the built-in microphone. Then, you can use any app to start recording. In the video below, I use the Camera app to record videos and binaural sound at the same time. Binaural recording is a special type of stereo recording that uses two omnidirectional microphones placed inside or close to the ears. This is an effective way to record what the sound would be as it reaches your eardrums. So, you will feel immersed in the environment. When you use other headphones to listen to the recordings, you can see that they are extremely realistic. It is like you are standing right there, so this is also called 3D sound. The only disadvantage is that it doesn’t have windscreens, so it will capture some noises in windy situations. I easily could install windscreens on my previous Sound Professionals binaural microphones. You can also install the AMBEO smart headset app on your phone but it is not mandatory. 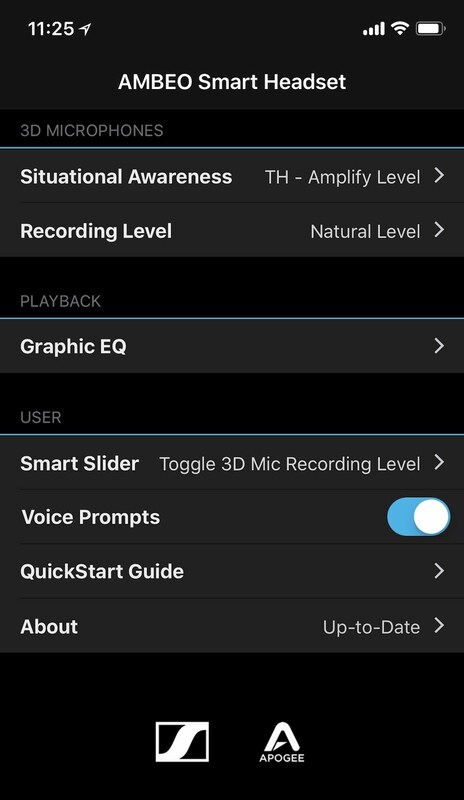 The app allows us to change situational awareness settings like Active Noise Cancellation or Transparent Hearing, adjust playback equalizer, and assign a function for the smart slider of the control module. In case you don’t install the app, you can use the in-line control module to adjust some settings. Another useful feature of the headset is noise cancellation. Since the Ambeo eartips fit snugly inside my ear canals, they’ve already provided great noise isolation. 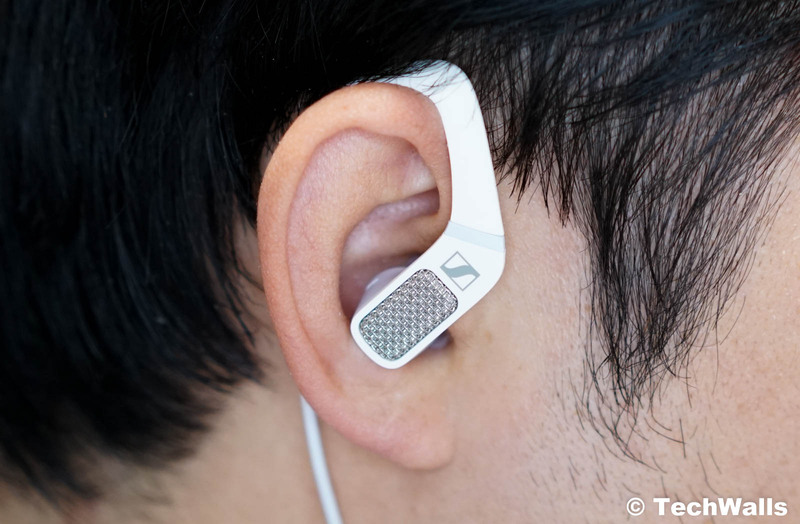 The extra noise cancellation feature helps block out around 70-80% of ambient noises. The audio quality is not only good in recording but also in playback. The Ambeo has a digital-to-analog converter (DAC) inside the control module and its performance is superior as compared to the iPhone’s built-in DAC. The DAC is combined with high-quality drivers and they create a stunning listening experience. 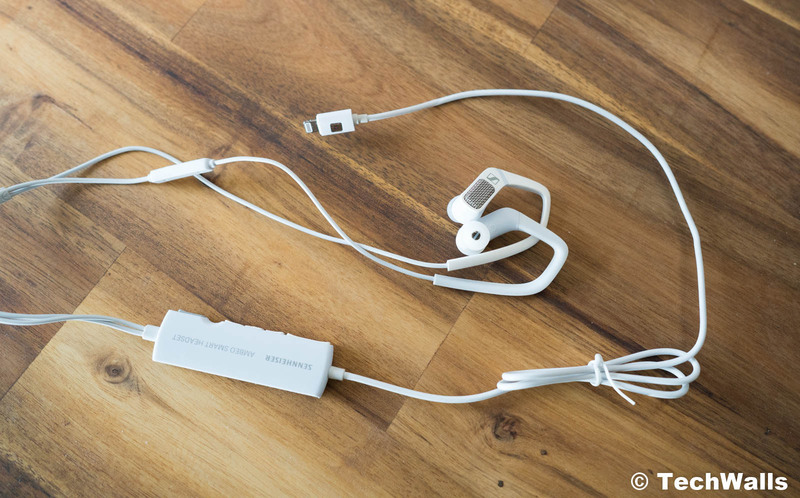 From my research, the Ambeo headset uses the same drivers as the ones on Sennheiser HD1 in-ear headphones. Therefore, there is no doubt about sonic characteristics of the headphones. These definitely are not reference headphones but the full and rich sound is so enjoyable. The bass is significantly boosted but it is adequate and not overwhelming like on other headphones. The treble is bright and crispy but not spiky, so the sound doesn’t feel uncomfortable at high notes. The mids are not recessed at all and they make the sound pretty clear. What I love the most is that the frequency ranges are not mushed together. This does not only make the sound clearer but also make the soundstage wider. I can hear great instrument separation even in normal recordings. The sound might not be suitable for audiophiles but it can easily convince most young listeners out there. 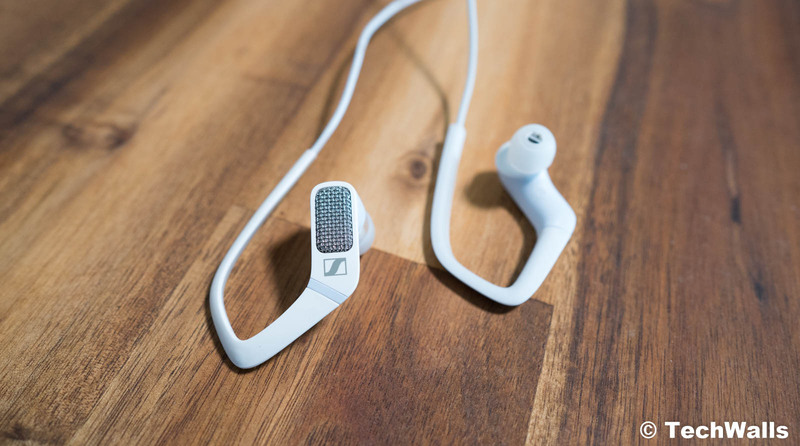 The Sennheiser Ambeo headset is truly a great solution for people who want to record videos with binaural sound on the go. It is a comprehensive device that makes binaural recording easy without any other equipment and you can also enjoy music from the high-quality drivers. I am actually using it more than I expected as it helps me live in those moments again. We at TechWalls highly recommend the product. A great headset for binaural recording and music playback.